3 See e.g. Steven BOX, Deviance, Reality and Society, London: Cassell, 1971. 2This attitude towards crime figures had, by the mid-seventies, almost assumed the status of a new orthodoxy, and even those who believed that there had been an increase in real crime were obliged to recognize that it was no longer possible simply to reproduce the latest police statistics as illustration and proof of their contention4. Surprisingly, however, by the end of the decade some of those who had been at the very forefront of the critical movement were beating a hasty retreat, at least on the question of the reality of the crime wave5. As in many other areas of intellectual and political life, the radicalism of the late sixties and early seventies would seem to have been tamed and the standard-bearers of the critical movement looked back with bemusement and some regret on the ‹ romanticism › of their youth. 3How are we to account for these shifts in perspective? I would suggest that, at the opening of our period, criminology, like many academic disciplines, was the preserve of a caste whose attitude towards crime was very little different to that of their nineteenth century predecessors6. The behaviour of the judiciary and the legislature represented the necessary and legitimate reaction of society towards those who broke its laws. To question the accuracy of the crime statistics, which recorded the decisions taken by agents of the state, would have been bad form. The criminologist's job was to produce explanations for the behaviour of criminals and criminals were, by and large, those people whom the law had found guilty of crimes. Studies demonstrated how lawbreakers differed from other citizens in their psychology, their upbringing or their social attachments, and these studies were mainly read by other criminologists, or by members of the professions concerned with processing criminals and delinquents, such as magistrates, police officials and probation officers7. Careers were constructed within a restricted social milieu where there was little room for maverick interpretations of the data. 8 See Steven BOX, Deviance, Reality and Society, 2nd édition, London: Cassell, 1986. 9 LEMERT, quoted in Steven BOX, 1986, op. cit., p. 19. 6Few of those entering the academies to study the social sciences were of mathematical bent, and in those institutions which imposed a course in statistics, they found matter enough for boredom, resentment and anguish. One professor of statistics has written that "students are often disillusioned with our introductory courses [...] They are ‹ turned off by statistics › and less numerate at the end of the course than at the beginning"14. So it was that for a large proportion of social science students, the most interesting parts of their courses were not those that relied heavily on a factual and preferably numeric presentation of the evidence, involving careful classification and accounting procedures, but those that gave the impression of having penetrated to ‹ where the action is ›, of having lived through the experience that Kerouac or Ginsberg sang of so enticingly and which certain Hollywood films had drawn upon. The daily lives of pool-hall hustlers, or Italian street-corner boys, written up with almost as much literary panache as the Beats could command, and guaranteed authentic by their appearance on university reading-lists were far more attractive than the dry technical treatises on mobility rates15. And much of this kind of literature was clustered around the study of deviance and criminality. 16 Jock YOUNG, The Drugtakers: The Social Meaning of Drug Use, London: Paladin, 1971. 7Furthermore, some of the student body were themselves becoming delinquent. Between 1960 and 1969, the number of convictions for Possession of Marijuana in Great Britain rose from 235 to 4,683; according to Jock Young, this particular drug was, at that time "increasingly associated with white middle-class youth and particularly students who often embrace a new form of bohemianism which has been popularly termed hippie"16. A growing number of students, then, would have had conflictuel relationships with the police arising out of their use of marijuana, or would have heard of such relationships, thus awakening some sympathy for members of other deviant groups pursued by the law. Moreover, those large numbers who had used drugs of some kind, but who had never been bothered by the police, would be far more willing to accept the critique of criminal statistics, which rested on the fact that a large proportion of criminal behaviour is never known to the police and therefore never appears in the figures. Many would have been left with a suspicion of the motives of the state, whose agents pursued you and locked you up for doing no more than exercising your personal liberty. 8These young people were not, of course, the ones who were going to forge the new conceptualisation of deviance. To a large extent, that work had already been done by people like Howard Becker, Erving Goffman or Harold Garfinkel17. What the students of the late sixties did do was to provide a ready readership for the works of the critical criminologists, a readership upon which the theorists and observers of the early seventies, such as Stanley Cohen or Jock Young, could build. Thus a context arose in which an increasing interest in delinquency and crime was generated, and in which a fair number of people were willing to listen to a particular kind of explanation of the phenomenon. 18 Op. cit., note 15. 9If one were to choose a seminal text in the critical criminological tradition, it would have to be Howard Becker's Outsiders18. The theoretical opening chapter, with its distinction between the labelled deviant, the unlabelled deviant, the deviant-labelled non-deviant and the unlabelled non-deviant, is quoted by almost all subsequent writers in the critical tradition19. And yet it is fair to say that this collection of essays probably owes its success amongst students of sociology and criminology to the ethnographic material, and in particular to the two essays entitled "Becoming a Marijuana User" and "Marijuana Use and Social Control". The former essay in particular gained a wide audience, partly, at least, because it seemed to offer a neophyte's guide to using the drug; as David Matza has noted, it could well have been entitled "How to Smoke Pot"20. Sociology teachers could recommend it to their students with some confidence that it would be read, and that, along with the bait, the theoretical hook might also be swallowed. 11This again appealed to the drug smoker, who legitimized her behaviour as being a question of personal morality rather than of law, and felt that the interference of the police and the judiciary in her affairs was an injustice. She regarded herself, then, as belonging to the category of those who were in reality ‹ innocent › and yet were labelled guilty by the forces of repression. She was therefore ripe to receive the message that crime figures were as much a product of police operations as they were of criminal behaviour, and it became an easy matter to regard convicted criminals and delinquents as being constructed by the judiciary process rather than as simply getting their just deserts. In addition, Becker, in suggesting that one could be wrongfully labelled, provided a ground upon which young people who had been denied access to the very highest reaches of the educational system might construct a more positive self-image. The ambiguities which Alvin Gouldner, for one, has noted in Becker's muted call to sociologists to decide whose side they were on, and to ‹ stand up for the underdog ›, enabled the neophyte intellectual to identify him or herself as belonging to a vast undertrodden group whose fate it had been to be numbered among the labelled rather than among the labellers22. Power, in Becker's formulation, is symbolic rather than economic; the dividing line between the oppressed and the oppressors is to be found at the point where report cards are written and criminal records are put on file. The basis for resistance is not an economic class, as in marxist analyses, but amongst the minor clerisy; the weapons are not those of class-warfare but those which enlightened intelligence brings to bear against dullness and obscurantism. 26 Stanley COHEN "Footprints on the Sand", op. cit., makes much the same point. 27 See note 22 above. 29 YOUNG, 1971, op. cit., p. 195. 14Young's early work appeals to two overlapping audiences: on the one hand, the academic sociologist who wished to stay tuned to the young people s/he was teaching and on the other, the members of a bohemian sub-culture, who were looking for a spokesperson. In the overlap between these two groups was the young social science student with professional aspirations, the would-be social worker, probation officer or technical college lecturer or the morrow's welfare state bureaucrat. To such as had the time to read closely enough, Young held out the possibility that the best could be made of both worlds; cakes could be both kept and consumed. 33 LEA and YOUNG, op. cit., p. 9 and TAYLOR, WALTON and YOUNG, op. cit., p. V.
15By the mid-seventies, this suspicion of the process of construction of crime statistics had become so common that even ‹ O › level texts were warning their young readers that the figures" tell us very little about real crime trends" and that "crime statistics are intended for administrative purposes, not for sociologists"31. The new faith formed one of the pillars of resistance to the ‹ law and order › politics of the Tory Party under Margaret Thatcher; leftist sociologists and criminologists dismissed the campaign as sheer opportunism with no basis in reality. However, by the end of the seventies, some English sociologists were having second thoughts; books now tended to open with reports of manuscripts being stolen from parked cars, or with muted apologies for earlier lapses into sentimentality or romanticism with regard to the criminal32. If the main thrust of earlier work was to demonstrate that the construction of crime statistics was such that the illusion of a crime wave could be created, more recently attention has been increasingly paid to the fact that, at any time, the police figures only represent the tip of the iceberg and that an immense volume of crime goes undetected and unpunished. Concomitantly, the sociologist no longer extends his sympathy to the perpetrators of delinquent acts - the hippy, the football hooligan or the black pickpocket - but to the working class victims of crime. Interesting in this respect is the book that Jock Young co-authored with John Lea, entitled What Is To Be Done About Law and Order?33. Whereas ‹ The New Criminology › of 1973 opens with a quote from a song by Bob Dylan - "To live outside the law you must be honest" - the later work quotes the words of council tenants complaining to officials about the trouble on their estate - "you don't care one sod about us and the vandalism that goes on around this estate". 16One again, this change in emphasis is a reaction to a complex change in circumstances, including the failure of the Labour Movement to retain its traditional clientele, the emergence of acute problems in the inner cities, the dramatic growth of evidence from victimization studies and so on. However, I wish to concentrate once again on the question of the relationship between the sociologists and their readership. If the expansion of the universities and polytechnics during the sixties contributed to the formation of a new readership and power-base upon which careers could be erected, by the late seventies, things had changed considerably. The young men and women who had purchased The Drugtakers were no longer students; they had gone on to jobs in teaching, local government, the health and welfare services and so on. They had not been replaced. Cuts in spending in Further Education had hit hardest in the social science sector, and particularly in Sociology - a trend that was to be intensified under Mrs Thatcher, who has a deep personal dislike of the discipline34. Over the period of a mere seven years sociology lost over 50% of its opportunities for postgraduate research. The younger sisters and brothers of those who were carried by the wave that brought Jock Young a post at the Middlesex Polytechnic could no longer hope to make their way into the academic establishment so easily. 17The readership had aged and had not been replaced. They were themselves now filling those frontline positions which the earlier work had criticised - they were teachers, probation officers and so on, or they had worked in the social security offices. However hard they may have tried to hold out against the informal mores of the professions which they had taken up, they had become that much readier to believe that if the kids in their classes learnt little it was because they were thick or idle, and if the young men who were their clients were time and time again getting into trouble it was because there was something wrong with them and not simply because of victimization by the police. The message which had so attracted them in their springtime was less enticing now. The authors had also changed - they had of course grown older, acquired lectureships, wives and mortgages. Rather than needing to create the opening breaks of their careers, they needed to consolidate. They could no longer appeal to the mass of young students over the heads of their research supervisors, for the mass had dissipated and they were themselves now supervising the research of a younger and less hopeful generation. 18The strange liberty of the late sixties and the early seventies was, then, in part the result of the extraordinary expansion in higher education, which, by creating a massive, youthful readership endowed with a certain scepticism with regard to the benevolence of state institutions, and a critical view of the behaviour of frontline authority figures such as the teacher, the magistrate or the policeman, and by offering rewards such as publishing contracts and openings for an academic career to those who could cater to this readership, made it possible for what had been a minority viewpoint concerning the crime statistics to rapidly attain the status of a semi-orthodoxy. The subsequent contraction within the social sciences helps to explain why some of the more vociferous proponents of this viewpoint have since retreated, and have reinstated the crime statistics as an index of real criminal behaviour, albeit in need of correction and refinement. The social fact, dissolved, relativized by the symbolic interactionists and ethno-methodologists, may not have returned in all its fully reified glory, but it has come some way towards doing so. What but yesterday were dismissed as fantasies whipped up by the mass media and self-seeking politicians have become the legitimate grievances of ordinary working people. The sociologist is both the manipulator and the creature of the community of readers to which he addresses himself and changes in the structure and character of the community will have a direct effect upon the author's discourse. 1 See Table 10. 3 in Graham SERGEANT, A Statistical Source Book for Sociologists, London: MacMillan, 1972, p. 131. 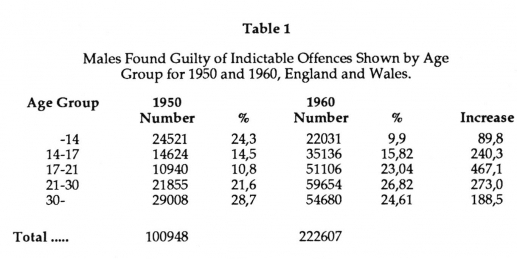 It is interesting to note that the only category with a decrease in criminal activity between 1950 and 1960 is that of boys under 14. This is largely due to changes in processing of young offenders. (The percentage do not add up to 100 due to rounding error). As we shall have occasion to see, not too much should be made of these statistics. 2 On the history of the relationship between the media and youth groups see Geoffrey PEARSON Hooligan; A History of Respectable Fears, London: MacMillan, 1983, and Stanley COHEN, Moral Panics and Folk Devils, London: Paladin, 1972. 4 See RADZINOWICZ and KING, The Growth of Crime: The International Experience, London: Penguin, 1977, in particular Chap. 2, "The Expanding Dark Figure of Crime", pp. 40-70. 5 See e.g. LEA and YOUNG, What is to be Done About Law and Order? Crisis in the Eighties, London: Penguin, 1984 and in particular pp. 135-147, where they discuss the rise in the crime rate amongst young blacks. 6 See Stanley COHEN, "Footprints on the sand: a further report on criminology and the sociology of deviance in Britain", in M. FITZGERALD, G. McLENNAN & J. PAWSON (eds. ), Crime & Society: Readings in History and Theory, London: R.K.P., 1981. 10 See table 6.1 in A. H. HALSEY (ed. ), Trends in British Society Since 1900, London: MacMillan, 1972. 11 "Sociology in the period 1950-1980 has experienced both very rapid growth, especially as a discipline in higher education and schools, but also in the area of applied social research, and a much more recent contraction both in development and in its public popularity", in the Introduction to ABRAMS, DEEM, FINCH and ROCK (ed.) Practice and Progress: British Sociology 1950-1980, London: George Allen & Unwin, 1982, p. 5. See also Philip ABRAMS, "The Collapse of British Sociology? ", in the same volume, pp. 53-70, where the author writes, notably, that "For a subject to lose over 50% of its opportunities for postgraduate research in the course of seven years is quite out of line with any normal conception of academic planning" (p. 54). He points out that "The rate of growth up until 1970 was of course phenomenal. Abbott has calculated a 450 per cent increase in the output of sociology graduates between 1952 and 1966. And her total of 724 graduating students in 1966 had increased again to 1,768 by 1971" (ibid.). 12 Colin LACEY, Hightown Grammar, Manchester: Manchester University Press, 1970. See especially pp. 53-62. 13 Bourgeois and petit-bourgeois youth does not seem to have attracted the sociologist until the hippie movement of the late sixties. Happily, novelists whose period of predilection was the late fifties and early sixties give us some feeling of what the time was like for disaffected middle-class youth. 14 A.S.C. EHRENBERG, "We Must Preach What is Practised: A Radical Review of Statistical Teaching", The Statistician, vol. 25 n° 2, pp. 1-7. Faced with student hostility to the subject, many university courses in Sociology dropped the obligation for their students to study statistics during the seventies. 15 Books such as E. LIEBOW, Tally's Corner, Boston: Little, Brown and Co, 1967. Erving GOFFMAN, Asylums, London: Penguin, 1963, and Stigma: Notes on the Management of Spoiled Identity, London: Penguin, 1969, W.F. WHYTE, Street Corner Society, Chicago: University of Chicago Press, 1955, (2nd edition), BECKER, GEER, HUGHES and STRAUSS, Boys in White, Chicago, University of Chicago Press, 1961, and Howard BECKER, Outsiders: Studies in the Sociology of Deviance, London: MacMillan, 1963, attracted a readership that was less than enthusiastic about the wealth of statistical information offered by, say, LIPSET and BENDIX, Social Mobility in Industrial Society, London: Heinemann, 1959. 17 For Becker and Goffman, see note 15 above. For Garfinkel, see Harold GARFINKEL, Studies in Ethnomethodology, New York: Prentice-Hall, 1967. See also A. CICOUREL, The Social Organization of Juvenile Justice, London: Wiley, 1968. 19 e.g. TAYLOR, WALTON and YOUNG, The New Criminology: for a Social Theory of Deviance, London: R.K.P., 1973, G. PEARSON, The Deviant Imagination: Psychiatry, Social Work and Social Change, London: MacMillan, 1975. Steven BOX, Deviance, Reality and Society, 2nd edition, London: Cassell, 1986, and so on. 20 Quoted in Stuart HALL & Tony JEFFERSON (eds. ), Resistance Through Rituals: Youth Subcultures in Post-War Britain, London: Hutchinson, 1975, p. 121. 21 Howard BECKER, 1963, op. cit., p. 9. The contradiction between Becker's typology and what he writes here is, of course, flagrant. See the discussion by Taylor Walton and Young, op. cit., and by Melvin Pollner in Melvin POLLNER, "Sociological and Common Sense Models of the Labelling Process", Roy TUR-NER (ed. ), Ethnomethodology, London: Penguin, 1974. 22 Alvin Gouldner has remarked upon this aspect of Becker's sociology in his essay "The Sociologist as Partisan", reprinted in Alvin GOULDNER, For Sociology: Renewal and Critique in Sociology Today, London: Penguin, 1973. He writes "Becker appears to be taking up arms against society on behalf of the underdog. Actually he is taking up arms against the ineffectuality, callousness, or capriciousness of the caretakers that society has appointed to administer the mess it has created. Becker's argument is essentially a critique of the care-taking organization, and in particular of the low level officialdom that manages them." He then suggests that "An underdog perspective may [...] be thought of as a career strategy more appealing to high variance betters who, in turn, are more likely to be found among the ambitious young," and concludes with the "bleak hypothesis" that "sociologists with liberal ideologies will more likely adopt underdog perspectives when they experience these as compatible with the pursuit of their own career interests." 24 Jock YOUNG, 1971, op. cit., and "The Role of the Police as Amplifiers of Deviancy, Negotiators of Reality and Translators of Fantasy: Some Consequences of our Present System of Drug Control as Seen in Notting Hill", in Stanley COHEN (ed.). Images of Deviance, London: Penguin, 1971. 25 See Geoffrey PEARSON and John TWOHIG, "Ethnography Through The Looking-Glass: The Case of Howard Becker", Stuart HALL & Tony JEFFERSON (eds. ), Resistance Through Rituals: Youth Subcultures in Post-War Britain, London: Hutchinson, 1975. The pot smokers are reported as being contemptuous of Becker's account, which, stressing the learned nature of drug experiences, was seen as underrating the intrinsic properties of the drug itself. "Howard Becker, change your dealer!" they cried. The authors of the study are highly critical of the phenomenological approach. Pearson indeed provides an interesting case of the theorist who goes against the stream both in holding out against interactionist flavoured accounts in the seventies and maintaining a radical institutionalism in the eighties. See his Hooligans, op. cit. 31 P.J. NORTH, People in Society: an Introduction to Sociology, London: Longman, 1973, pp. 180-1. This could be usefully compared with an earlier university level text-book such as Stephen COTGROVE, The Science of Society: an Introduction to Sociology, London: George Allen and Unwin, 1967, especially p. 290. 32 See, for example, the introduction to LEA and YOUNG, op. cit., p. 7, where they claim that the manuscript of their opening chapter was twice stolen from parked cars. 34 This probably stems as much from the 'hard' scientist's suspicion of the 'non-scientific' mumbo-jumbo of the social sciences as from any belief that sociology is naturally left-wing. It isn't. For the radical fall-off in the numbers of opportunities for sociologists over the last few years, see COHEN, "Footprints", op. cit. and especially ABRAMS, op. cit. MASON, Timothy. Reading the Crime Rates: Shifts in Perception of Deviance Since 1965 In : Les fictions du réel dans le monde anglo-américain de 1960 à 1980 [en ligne]. Tours : Presses universitaires François-Rabelais, 1988 (généré le 20 avril 2019). Disponible sur Internet : <http://books.openedition.org/pufr/3806>. ISBN : 9782869064546. DOI : 10.4000/books.pufr.3806. Mason, Timothy. “Reading the Crime Rates: Shifts in Perception of Deviance Since 1965”. 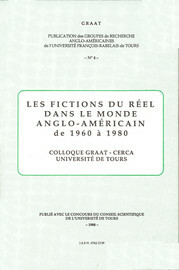 Regis, Jean-Paul, et al.. Les fictions du réel dans le monde anglo-américain de 1960 à 1980. Tours : Presses universitaires François-Rabelais, 1988. (pp. 13-24) Web. <http://books.openedition.org/pufr/3806>. REGIS, Jean-Paul (dir.) ; MENGET, Maryvonne (dir.) ; et CHENETIER, Marc (dir.). Les fictions du réel dans le monde anglo-américain de 1960 à 1980. Nouvelle édition [en ligne]. Tours : Presses universitaires François-Rabelais, 1988 (généré le 20 avril 2019). Disponible sur Internet : <http://books.openedition.org/pufr/3799>. ISBN : 9782869064546. DOI : 10.4000/books.pufr.3799.